The Mack 6x2 Liftable Pusher Axle is available on Mack Anthem models, which monitors trailer weight and adjusts the truck’s driveline configuration to boost fuel efficiency without impacting performance. The system utilizes sensors in the rear suspension to determine payload and either lift or lower the foremost rear axle. When an empty load is detected, the axle lifts, allowing the tractor to operate as a 4x2 for less drag, increasing fuel efficiency from 3 to 5 percent. Another benefit is increased tire life by up to 20 percent, which helps lower maintenance costs. For full loads, the same axle is lowered to provide additional stability and distribution of the trailer’s weight. The 6x2 Liftable Pusher Axle saves up to 400 pounds of weight compared to a typical 6x4 configuration. Mack’s 6x2 Liftable Pusher Axle also includes an Automatic Standby Mode that eliminates the need for the driver to manually push buttons to initiate standby mode. Mack added rear air disc brakes as an option to its 6X2 liftable pusher offer. 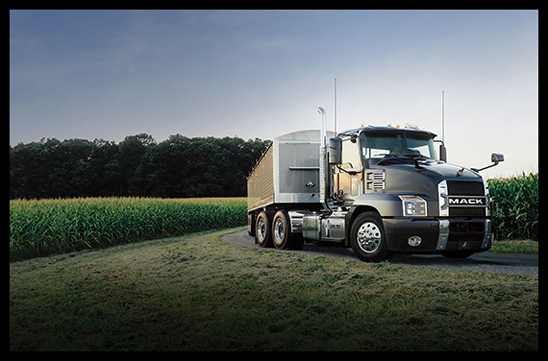 The 12-speed Mack mDRIVE automated manual transmission is standard on Anthem models. The mDRIVE, which is fully integrated with Mack MP engines, uses a number of sensors to measure grade, load, speed and other variables to maximize performance and fuel efficiency by automatically selecting the best gear for conditions. To learn more about the Mack Anthem, visit www.MackTrucks.com.